Who was allowed to vote in elections in the early 1800's? White males, they didn't have to own land at this point in time. Did a person who worked his own land need other people to help him? What policy/doctrine did the speaker just reference (Europe isn't allowed to colonize anywhere in the Western Hemisphere)? Which states were admitted as slave states? What was Martin Van Buren credited for starting? What was Andrew Jackson so popular for? Was Andrew Jackson a murderer? What characteristics did the typical member of the Democratic party have? Why was South Carolina so mad after the tariff of 1828? What do you think 'appropriate Indian land' means? What percentage of Indians died on the Trail of Tears? This part doesn't matter to you! Pay attention again at the 12:00 mark. What powerful tool of policy did Andrew Jackson use more than any president before him? What did the Spoils System do? Who is inflation bad for? its not bad, more dollar bills = good times! Was Andrew Jackson's bank policy great or awful? 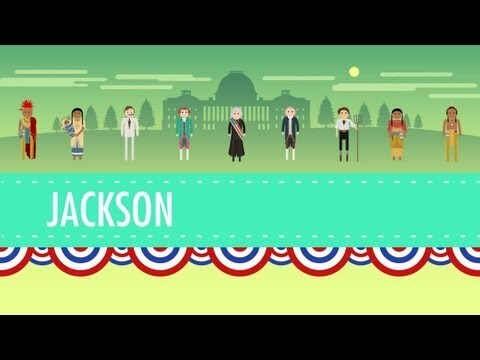 What did Andrew Jackson do for the American presidency?